A new year means a new beginning and a new bullet journal! The start of a new year is always the perfect time to get organized and what better way than with a bullet journal. Start the year fresh and get off on the right foot by using your very own bullet journal to plan your year. Use your 2019 bullet journal to plan the year before you and set your goals and intentions for the new year. Feel free to get as in-depth as you want with your bullet journal. I like to section my bullet journal into months, but you can choose many different layouts. It doesn’t matter how you choose to layout your bullet journal, there are certain pages that must be included in every bullet journal! You can use many different pages to keep track of your goals this year. 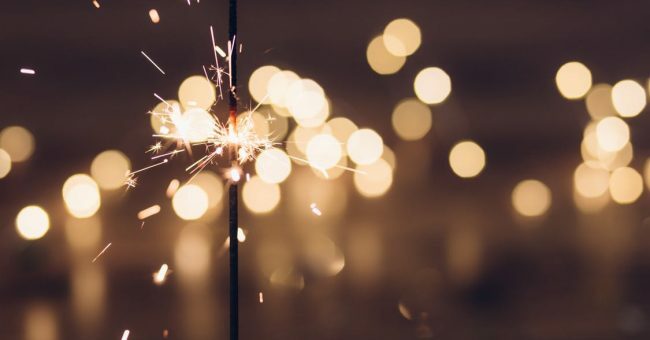 From what you want to accomplish to your bucket list, jot down all of the things you want to get done in 2019. Keeping a list of your goals will help motivate you. And don’t forget to mark off your goals when you reach them! Goals might be a serious subject, but still have fun with it and show your character by decorating your pages! If you are working on a transformation goal, include before and after pictures to add a little something to your bullet journal. A bullet journal will also help you keep track of other important dates besides just appointments! Yearly planning can be overwhelming, but can be done easily with a bullet journal. Smartmomssmartideas has a list of ideas. Keep track of birthdays, holidays, weddings and anniversaries. This way, you won’t forget to send that special card or birthday present. You can also use your bullet journal to keep track of those things and help you budget for those gifts and cards. I find it helpful to add these items to a year at a glance view to help stay organized. Spring cleaning is a thing, but I like to get started early! 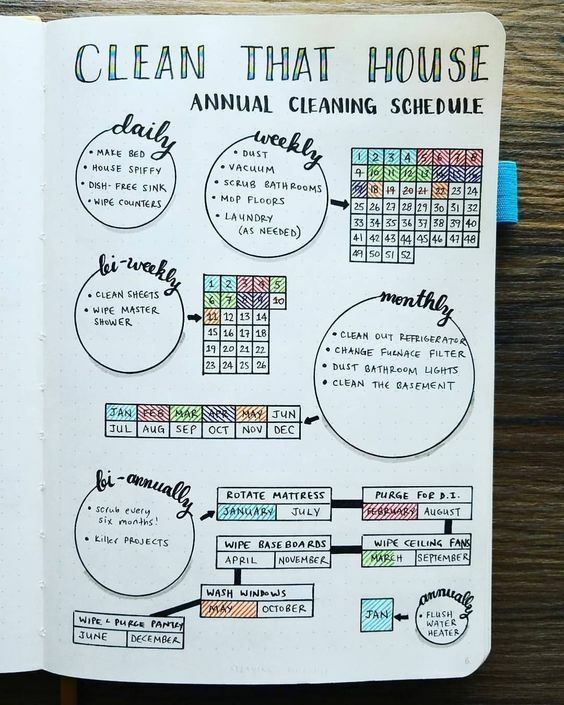 And with the help of my bullet journal, my house will be sparkling clean year round. Make a daily, weekly, monthly and yearly list. Include all of the things you want to clean and even organize throughout your home. Don’t forget to add your car to it! (Monthly for me!) You can get inspired by Pinterest on different ways to make these lists. There is just something about starting a new year that inspires us to better ourselves and that starts with self-care! I always set out the intention to get healthy inside and out each year and a bullet journal helps keep me on my toes. I don’t know about you, but I always have appointments throughout the year for facials, manicures, pedicures, eyebrow waxing and for my hair. It can be hard to keep track of, not to mention throwing in all of the yoga classes in there. I use my bullet journal to keep track of all of my appointments, plus it helps keep me on top of my beauty routine. All of these appointments can cause for a busy life, but use your bullet journal to add in relaxation time and time for yourself. Staying social with friends and family also helps with keeping you mentally and physically active, adding to your overall health. If you are struggling to find a beauty routine that works for you, take advantage of your bullet journal and use it to start one! You could even add in some fun things you want to try this year like a new healthy dish or a self-help book! Pageflutter can help you get started with some amazing ideas. Fitness is part of self-care, but to me it is so important that it needs its own page, maybe even its own section! A bullet journal holds me accountable with a fitness tracker. Anjahome has some great ideas to get you started. Of course, it depends on how ambitious you want to be, but try to set the bar high and use these ideas as resources. Some ideas include meal planners, exercise trackers and even a mood tracker. Think of it like planning your journey and then recording it. Make sure you stick to it and then you can look back at the end to see how hard you worked for your results. Always keep track of your results and maybe even add in before or after photos. It is a great way to turn your bullet journal into a scrapbook and reflect on your efforts! Start off the year right by being grateful! I use my bullet journal to help keep me grounded year round. Really take time to use your bullet journal as a tool to reflect and better your life. A list of inspiring quotes about life and motivation is a great page to add. You can go back to it and read it throughout the year. 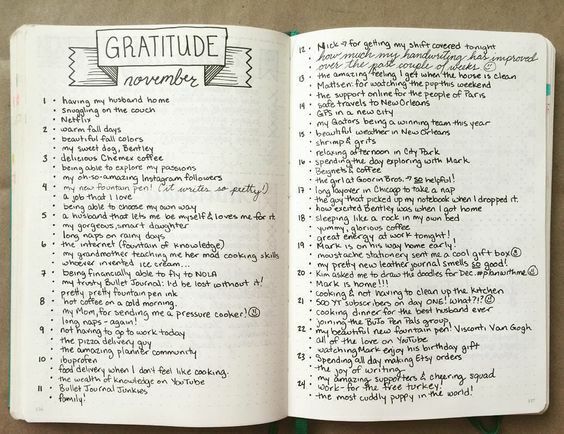 Also, a page of gratitude where you list all of the things you are grateful for and add to it as the year progresses. These are great reminders to help you enjoy and appreciate your life. Pinterest always has creative ideas for every bullet journal, especially fun ways to add quotes! 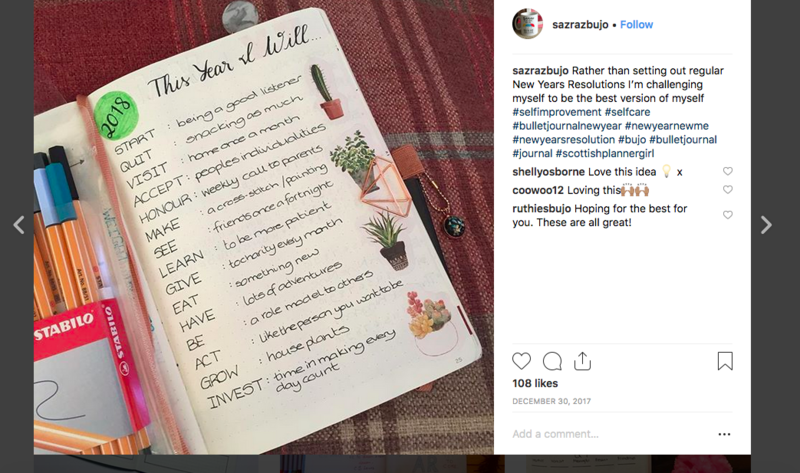 Not sure how to get start with your bullet journal? 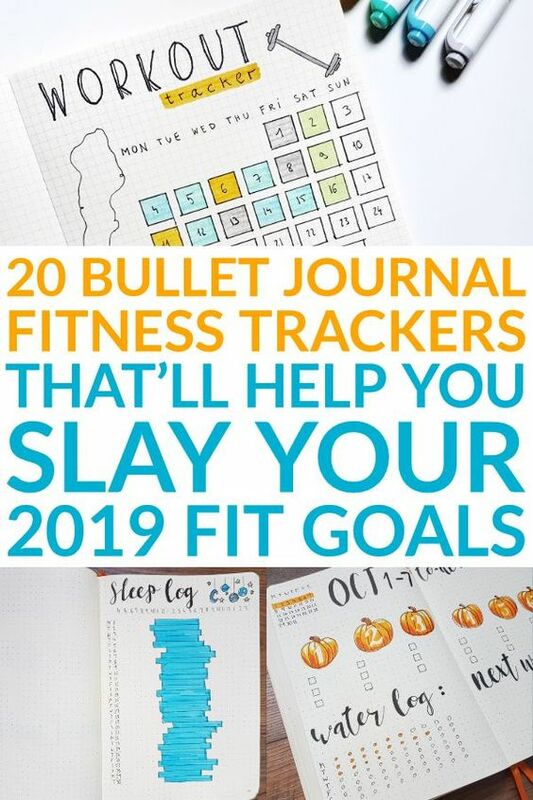 Check out our other blogs for tips and tricks for your bullet journal.